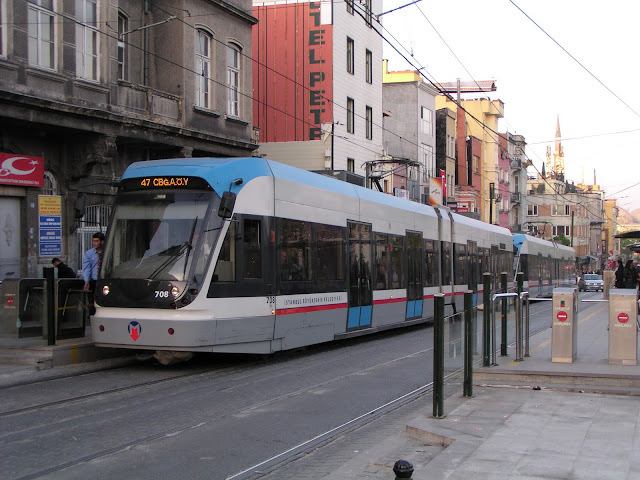 The modern tram we used daily to get around Sultanahmet & Beyoglu. We left the window cracked open overnight for some cool air. Big mistake! The 5:10 am call to prayer nearly shook us out of the bed. Shortly after, the horns started honking on the busy side street (more like an alley) below. Neither of us slept great; so the alarm was turned off; & we stayed in bed a little longer. Went up for breakfast which is a strange array of foods. There's cereal & raisins (some put yogurt instead of milk over it & it looks disgusting). They have this fabulous cherry juice, the fresh fruit is awesome. They make their own jams (apricot, quince, strawberry, pear & orange) which are divine. They have hard boiled eggs, scrambled (sometimes), 5 different kinds of olives, tomatoes baked w/ cheese on top; & these interesting phyllo pastries rolled around cheese. With all the fish we've been eating, I was meat starved. So I took a chance on these 3 plates of cold cuts they've been putting out. Let's just call them "mystery meats"; & leave it at that. Despite our (half assed) best efforts, we didn't get our day started til nearly 10:30. So much for the best laid plans of mice & men. 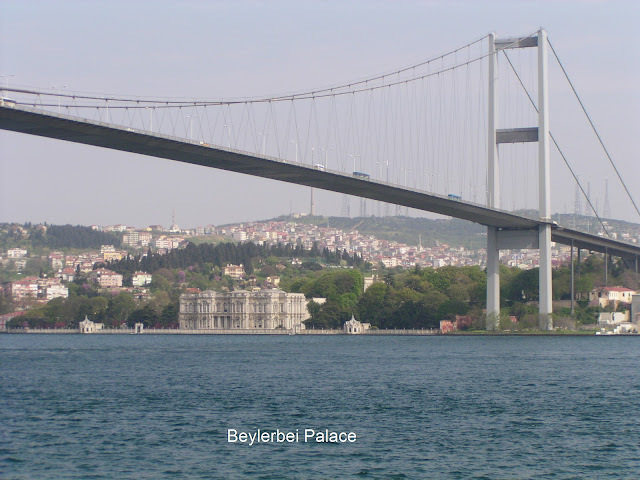 We find out that the ferry over to Beylerbeyi Palace (on the Asian side) doesn't run on Saturdays. A man on the docks whom we had seen on Thurs. (& had asked for directions) was there again w/ his map. Since the ferry was out he offered a private boat ride over. He would wait for us & bring us back to the Euorpean side to visit another palace for 140 YTL. We didn't have that much lira; so we said no. 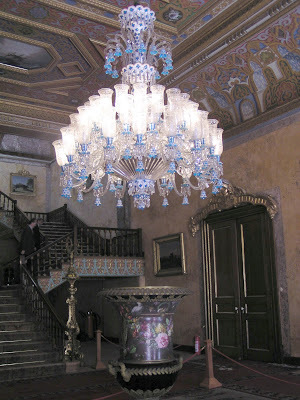 Then he offered to drive us to both palaces for 120 YTL. Still too much. So finally, he said, "for you, 100 lira". We were only a little apprehensive; but both of us were getting pretty good vibes about this guy. Then I asked him what kind of car he had. He smiled & said "an '04 Honda". We thought "what the hell-just another adventure". Off we went. Like every other Turkish driver, he drove fast & defensive. 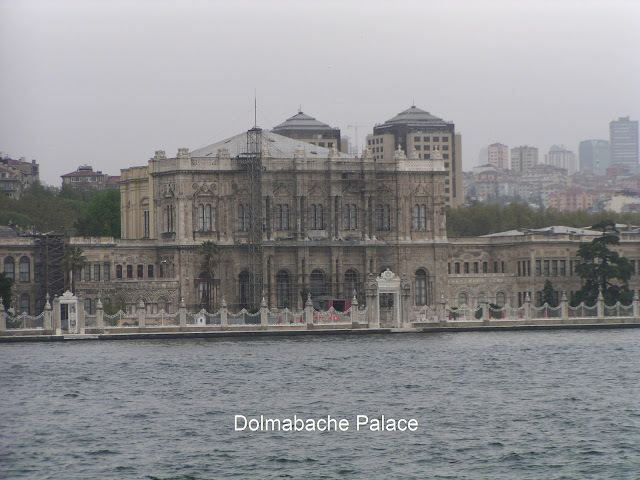 Our first stop was Dolmabache Palace on the European side in the new town area of Istanbul. 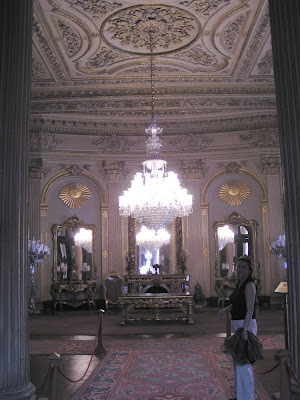 It was magnificent (right up there w/ the opulence of the Pitti Palace in Florence). 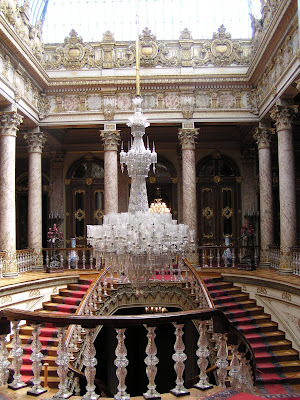 The ceiling frescoes, medallions, crystal chandeliers that weigh tons, ornately carved furniture & even Baccarat crystal spindles on the curved double staircase. We were supposed to be following the English speaking guide; but we kept lagging behind taking so many pics. 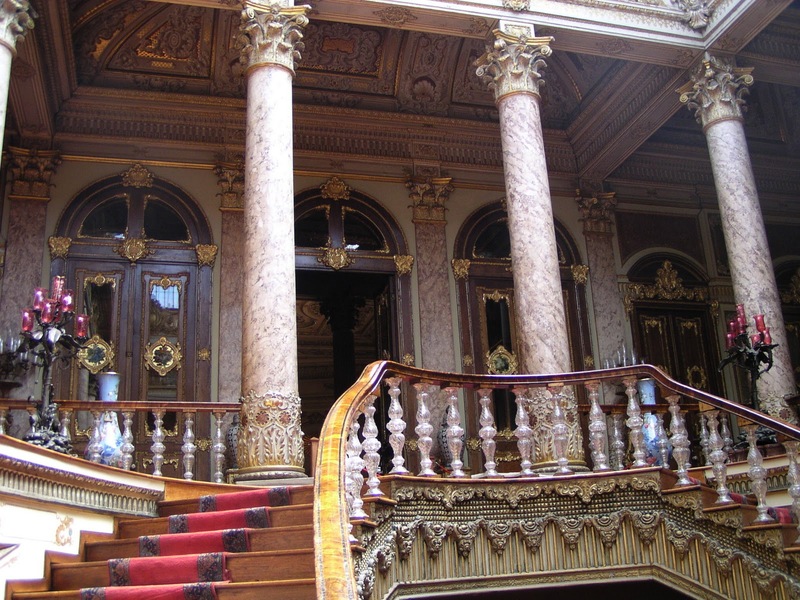 It's right at the edge of the Bosphorus w/ massive gold gilded gates that lead out to the marble steps at the edge of the sea. Back in the day, you would board your waiting boat right there on those very steps. It would be similar to arriving at a hotel landing stage in Venice. The trees, flowers & fountains in the gardens were spectacular. It was a long ride up the European coastline in order to reach the bridge to drive over to the Asian side. We passed charming fishing villages & towns along the way. 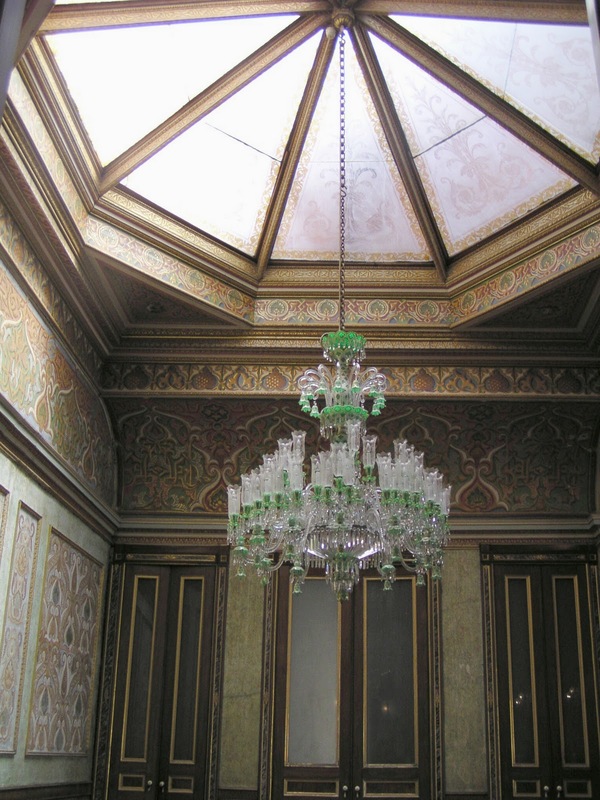 Beylerbeyi Palace is only slightly less awe inspiring than the other. It also sits at the edge of the Bosphorus flanked on each side by 2 hamam (seperate outdoor bath houses) w/ marble floors, frescoed dome ceilings & a wall of windows to the sea. 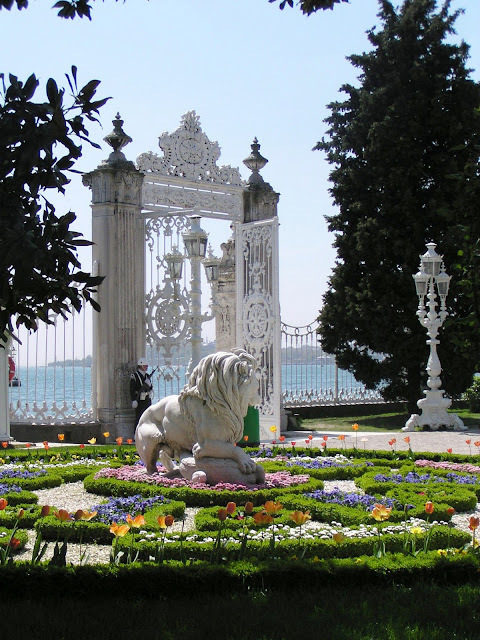 There are lovely floral topiary & sculptured gardens. 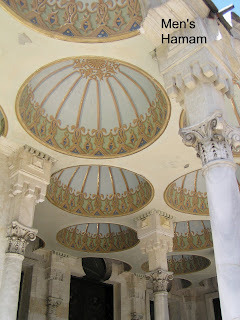 The Palace walls look slightly shabby in an ornate way. The floors are covered w/ woven straw on top of which they have ancient silk rugs. They require plastic booties over your shoes. 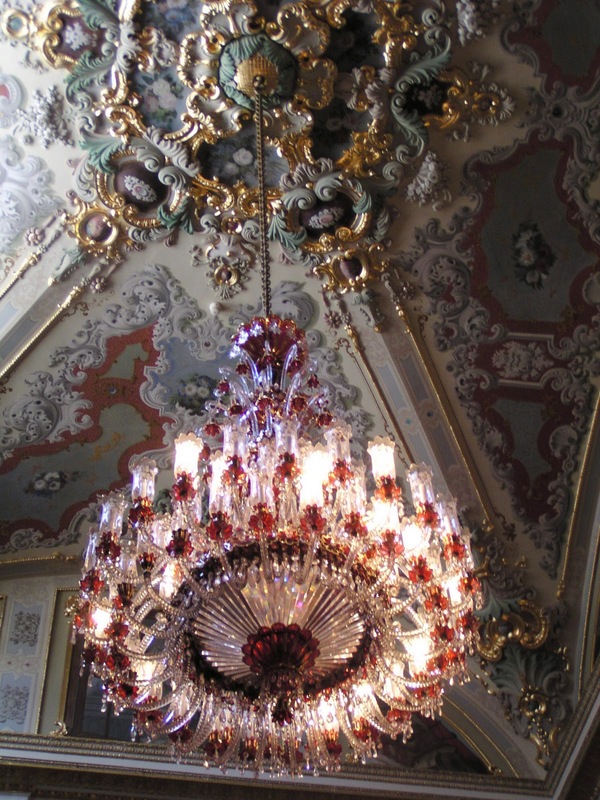 They tended to rush us from room to room in a surly sort of way (reminds me of the folks at the Hermitage Museum in St. Petersburg, Russia). 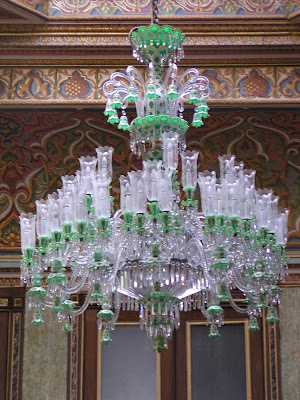 Again, big honkin' chandeliers, sort of Murano, Italian type. 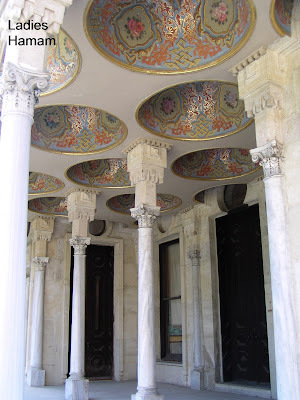 Colors ranged from greens, blues to red w/ matching draperies. 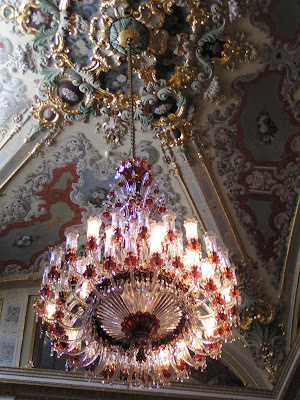 Furniture (which was arranged for viewing as opposed to living) was very Baroque in style, extremely colorful brocades. It might have been better to have reversed the order of the Palaces, building up to the more impressive Dolmabache. 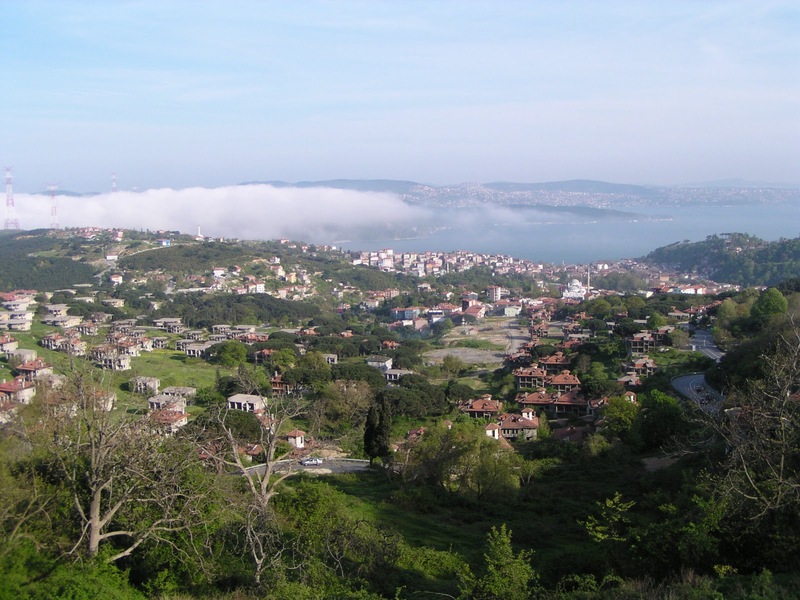 Our driver, Aziz, said we should have an early dinner on the Black Sea since our Bosphorus ferry tour didn't take us that far north. Fortunately for us, the price didn't go up; so we took him up on it. 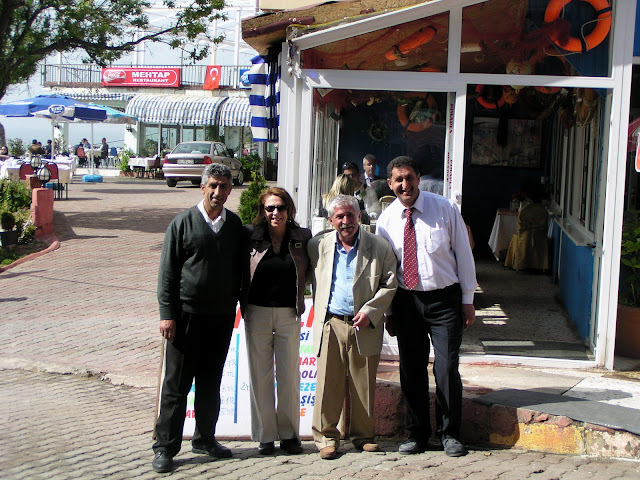 He has friends that have a darling fish restaurant clinging to the hillside just above the beach in Kilyos. That's Aziz in the middle w/ Katie. 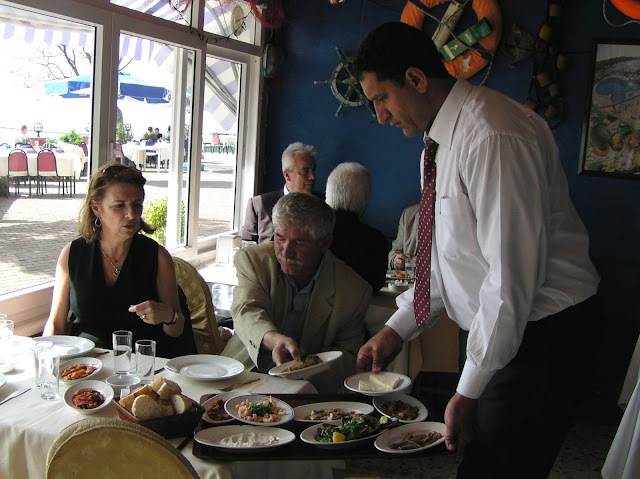 Aziz picked out the fish (turbot again). We chose the bean salad, eggplant salads, baked mackerel & a luscious (hot) chili/tomato salad which we placed on bread. We wanted soup; & since they didn't have any made, Aziz asked him to go whip up some. A thin tomato soup was brought out; not exactly appetizing. But w/ a squeeze of lemon & some of the chili spread (Katie's concoction) it was quite good. The fish arrived lightly battered & fried w/ some sliced tomatoes, cucumbers & sweet peppers. A fruit plate followed; & then Aziz requested some special dessert. Shredded carrots baked in foil w/ honey & cinnamon (already forgot the name). I thought it was so-so. Cost of this seaside dinner for 3, 100 YTL. The long ride back took even longer because the traffic along the shore road was moving so slowly. We ran out of Turkish lira; so Aziz agreed to take partial payment in USD. During our ride back down to sea level, low clouds covered the Bosphorus & Black seas. My newly found friends from the Cruise Critic message boards were arriving at the hotel today from Montreal. I had left a note for them at the desk, hoping to hook up w/ them. But who knows whether they came in & went to bed or out sightseeing. Can't wait to meet Eileen & Brian in person. We decided to go to the internet cafe to type another travel diary e-mail before retiring. So, we stopped at the ATM by the hotel to get a few more YTL using Katie's card (mine hasn't worked on the previous 2 attempts). It was out of order; so we continued to walk about 5 blocks to another one. This one unfortunately didn't offer options in English; & we didn't find this out until it was too late. When Katie didn't respond to the prompt in Turkish, it ate her card! Fortunately, this happened right next door to the tourist police station. A nice young policeman called the emergency number to the bank. They said to call the US bank to cancel the card; or we could come by the main branch on Monday & get the card back. 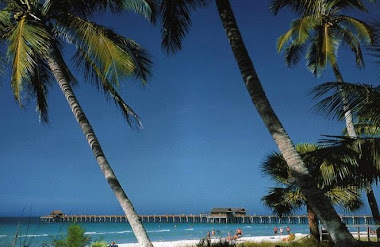 This wasn't going to be possible as we would be boarding the ship & departing that day. Katie was really PO'd, walking (her frustration off) so fast back to the hotel that I couldn't keep up w/ her. We used our cell phone to try to call the US bank. She gets lost in menu hell for quite a while; & finally gives up. She decided to call & leave a message for Bob to ask him to contact the bank for her on Mon. morning. Needless to say, we never made it to the internet cafe. A bad ending to an otherwise great day!